Focus of this WTZ project was a bilateral exchange of views on the vernacular built heritage in Albania and Austria on a comparative basis. Austria and Albania are two countries sharing the experience that architectural witnesses made out of earth and stone are continuously and rapidly disappearing. Thus, expert knowledge on these building materials has become rare. This complicates the conservation of architectural heritage and threatens the continued existence of a centuries-old European architecture. The stock of the vernacular built environment seems to be unstoppably decimated by demolition, in many cases out of ignorance. Negligence and no or inappropriately conducted maintenance precede this irreversible loss. Therefore a detailed recording of the existing architecture and the development of new approaches towards its renovation are important parameters in both partner countries. Only through a European-wide process of communication and transfer of knowledge a sound basis for a better handling of this heritage can be provided in future. Within manifold meetings and common activities such as excursions, building surveys and restauration workshops Austrian and Albanian partners have worked out a joint strategy containing different parameters, why and how the built heritage made out of earth and stone in Europe should be protected. 16th – 20th Sept. 2015: Meeting at TU Vienna, lectures about earthen architecture in Austria, discussion. Excursion to the Weinviertel/Lower Austria to visit traditional earthen architecture. 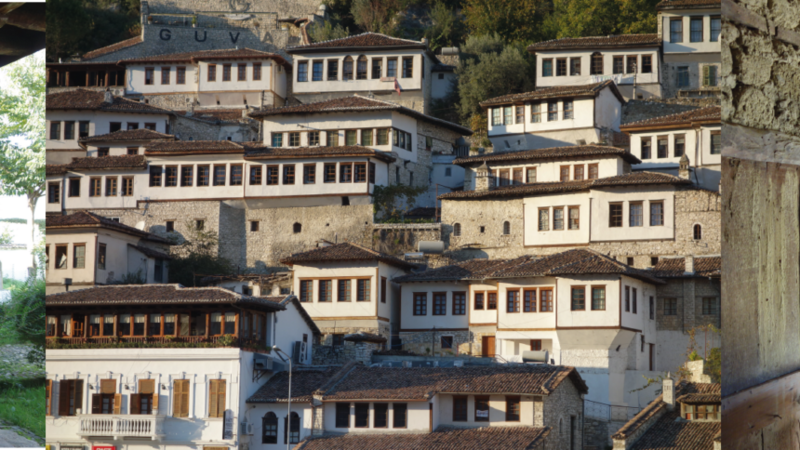 Excursion to Berat/Vlora: Berat old town (stone and earth architecture – UNESCO world heritage) and castel, traditional villas in Vlora. Sept. 2016: 10th Heritage Week in Gjirokastra, building surveys and presentation of student works from TU Vienna and discussion about future developments regarding the UNESCO world heritage site of Gjirokastra. 15th – 21st Dec. 2016: Building research route: Gjirokastra – Korçe – Lin. Comparative research on different earth and stone building techniques, taking of material samples of earth and mineral substances for analysis in building laboratory. At the moment two joint publications about vernacular architecture on the Balkans (with focus on Albania and earthen architecture) are being generated for two journals: The International Journal of Business and Technology (ISSN 2223-8387) and the Journal for Comparative Cultural Studies in Architecture (ISSN 1865-8806). In the course of the project students of Polis University have assembled a documentation with buildings surveys collected under the topic: “Albania Adobe Constructions” (Tirana, 2015, unpublished building documentation). Albanian and Austrian partners participated in two conferences in Durres/Albania: 6th Nov. 2015, 5th International Conference on Architecture and Spatial Planning (IC ASPCE), and 4th-5th Nov. 2016, 6th international Conference on Architecture and Spatial Planning (IC ASPCE). At both conferences the project advancements and research results were presented.